Freshwater wetlands are an integral part of central Florida, where thousands are distributed across the landscape. However, their relatively small size and vast numbers challenge efforts to characterize them collectively as a statewide water resource. Wetlands are a dominant landscape feature in Florida; in 1996, an estimated 11.4 million acres of wetlands occupied 29 percent of the area of the State. Wetlands represent a greater percentage of the land surface in Florida than in any other state in the conterminous United States. Statewide, 90 percent of the total wetland area is freshwater wetlands and 10 percent is coastal wetlands. About 55 percent of the freshwater wetlands in Florida are forested, 25 percent are marshes and emergent wetlands, 18 percent are scrub-shrub wetlands, and the remaining 2 percent are freshwater ponds. 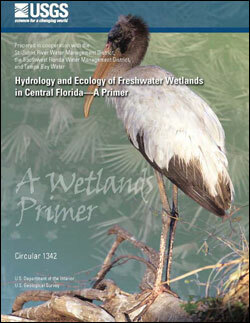 Freshwater wetlands are distributed differently in central Florida than in other parts of the State. In the panhandle and in northern Florida, there are fewer isolated wetlands than in the central and southern parts of the State, and few of those wetlands are affected by activities such as groundwater withdrawals. In southern Florida, the vast wetlands of the Everglades and the Big Cypress Swamp blanket the landscape and form contiguous shallow expanses of water, which often exhibit slow but continuous flow toward the southwestern coast. In contrast, the wetlands of central Florida are relatively small, numerous, mostly isolated, and widely distributed. In many places, wetlands are flanked by uplands, generating a mosaic of contrasting environments—unique wildlife habitat often adjacent to dense human development. As the population of central Florida increases, the number of residents living near wetlands also increases. Living in close proximity to wetlands provides many Floridians with an increased awareness of nature and an opportunity to examine the relationship between people and wetlands. Specifically, these residents can observe how wetlands are affected by human activities. Freshwater wetlands are unique and complex ecosystems defined by characteristic properties. Wetlands usually have standing water during at least part of the year, although water depths can vary from a few inches to as much as several feet from one wetland to another. The hydrologic behavior of wetlands is influenced by drainage basin characteristics, as well as by natural variations in climate. Wetlands in central Florida (especially forested wetlands) often have acidic waters that are darkly stained from organic substances released by decomposing leaves and other plant material. Wetlands are characterized by biogeochemical cycles in which vital elements such as carbon, nitrogen, phosphorus, and others are transformed as they move between wetland soils and sediments, the open water, and the atmosphere. Wetlands are populated with plants that can thrive under conditions of saturated soils and low dissolved-oxygen concentrations. The bottoms of many wetlands, especially marshes, are covered with decayed plant material that can accumulate over time to form brown peat or black muck soils. Wetlands are inhabited by animals that need standing water to complete some or all of their life cycles, and they also provide periodic food, water, and shelter for many other animals that spend most of their lives on dry land. The complex and interrelated components of wetlands directly affect one another and there are numerous feedback mechanisms. Haag, K.H., and Lee, T.M., 2010, Hydrology and ecology of freshwater wetlands in central Florida—A primer: U.S. Geological Survey Circular 1342, 138 p.